Decorate the 2" round area of this 28 oz. porcelain creation urn with the picture of a loved one. The 6" tall urn has a 24kt. 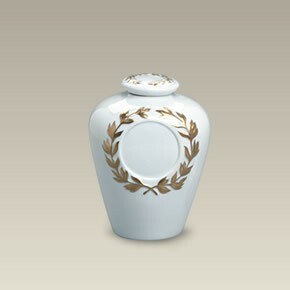 gold painted embossed wreath design around the decorating area on the urn and also on the lid. Made in China. Non-microwavable. Hand wash.